Our U10 Boys and Girls practice twice a week under the watchful eye of Club Director Todd Kingsbury and his staff. In addition to this, they have futsal (5v5) games on Friday evenings, which kick off between 4 and 6pm. NEW THIS YEAR! The U10's will have a 30 minute balance/coordination/agility session on Tuesday nights. The girls will have their normal training from 5-6pm then head to Field 4 (our warm-up space) for a 30 minute session. The boys will start with a 30 min session on Field 4 from 5:30-6pm, followed by their normal hour long session on the field. It is vital to build in this kind of work at a young age while kids are still mastering their motor skills. Our U10's play in the Far Post Futsal League on Friday nights. 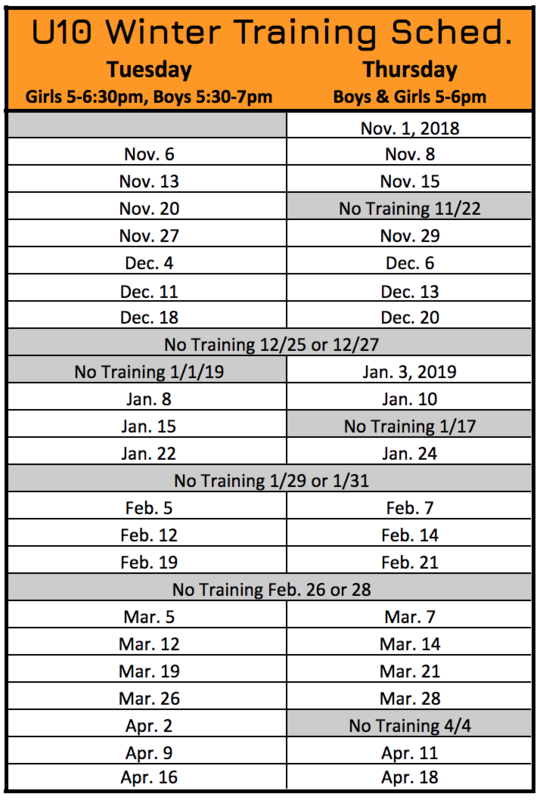 There are 3x 7 week Sessions (Nov/Dec, Jan/Feb, and late Feb/early Apr). To sign up, email Todd. You can find the schedule under the INDOOR LEAGUES tab on our website navigation bar, then click LEAGUE SCHEDULES & RESULTS. We offer 2 sessions of our U10 Excellence Program each week for those looking to play more. These are an additional expense. More info can be found at the following link.